From May the 4th through to May the 6th 2018, the county of Kerry will be transformed into a galaxy far far away as we welcome the inaugural ‘May the 4th Be With You’ festival. Over this long awaited weekend, Star Wars fans will travel from all corners of the earth to take part in numerous events, which will be held in Ballyferriter, Ballinskelligs, Portmagee and Valentia Island. 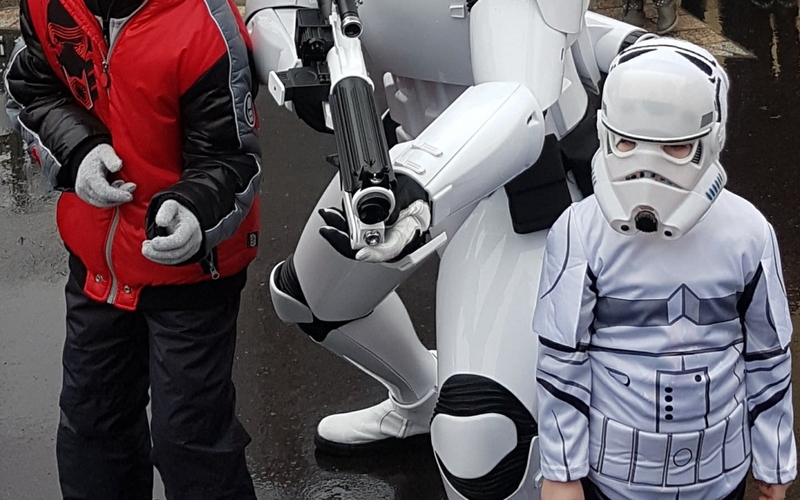 This spectacular event was organised by Fáilte Ireland and looks set to be a hit with Star Wars fans of all ages. The three day festival will celebrate Star Wars Day in a way that no other festival has done before with film location tours, drive-in screenings of the newest instalments of Star Wars, workshops for all ages and a host of other daily events that will focus on the Irish connection. As many of you die hard fans will already know, Kerry, in particular Skellig Michael, featured heavily in the last 2 instalments of the latest trilogy. ‘The Last Jedi’ made Skellig Michael the focal point of the movie and since then this area of Kerry has been inundated with visits from Star Wars fans. It is indeed fitting that the surrounding villages and locale will play host to this wonderful event. The team here at Flynn’s Coaches are huge Star Wars fans and we can’t wait to welcome visitors from across the globe to this beautiful part of the country. For those of you who are travelling to the event next week and have yet to organise transportation, please do get in touch with us and we will assist you in any way we can. Our fleet of coaches and our luxurious chauffeur services are on offer for the weekend and will be the perfect way to travel between locations without having to worry about transfers, event start times or relying on public transport. Choose from car hire, private mini-bus hire, coach hire or chauffeur driven vehicles. Do you require transport to and from the airport? Give us a call today to learn how Flynn’s Coaches can make your May the 4th weekend a time to remember! Official launch of the ‘May the 4th Be With You’ festival. Photography and Video Exhibition: Take a trip through time with this immense collection of photographs and videos all detailing the time the Star War’s crew spent filming in Kerry over the past number of years. A two and a half hour coastal cruise, which will take in scenes from the infamous ‘The Last Jedi’. This looks like being one of the most anticipated events so make sure you book early. Have your own craft? Whether you have access to a yacht, a powerboat or a RIB, you are invited to join the flotilla of boats that will sail from Dingle to Smerwick Harbour and take in all the superb Star Wars locations along the way. Film Location Walks: Take in all of the locations used in the Star Wars movies with a guided tour and discover how the cast and crew made Ballyferriter their home for the duration of filming. Take a boat trip to Skellig Michael: This mystical island is without doubt one of the most iconic locations ever used for a Star Wars movie and has long been the pride and joy of the people of Kerry and indeed Ireland. See the famous beehive huts and walk in the steps of your favourite Jedi Luke Skywalker. Puffin Workshop: You love Porgs right? Who doesn’t? Did you know that the Porgs introduced in ‘The Last Jedi’ were actually inspired by the puffins that make their home on Skellig Michael? Take the puffin workshop at the Skelligs Visitors Centre to learn how the puffins of the island made this impressive transformation. This is just a fraction of what is on offer over the festival weekend and we know you’ll want to partake in as many of these events as possible. For transport between events, get in touch with Flynn’s Coaches today and we will make sure you will never miss a second of the action.